A new Geekbench listing has been found for the upcoming Google Pixel 3A smartphone and it confirms the mid-range specs of the phone. 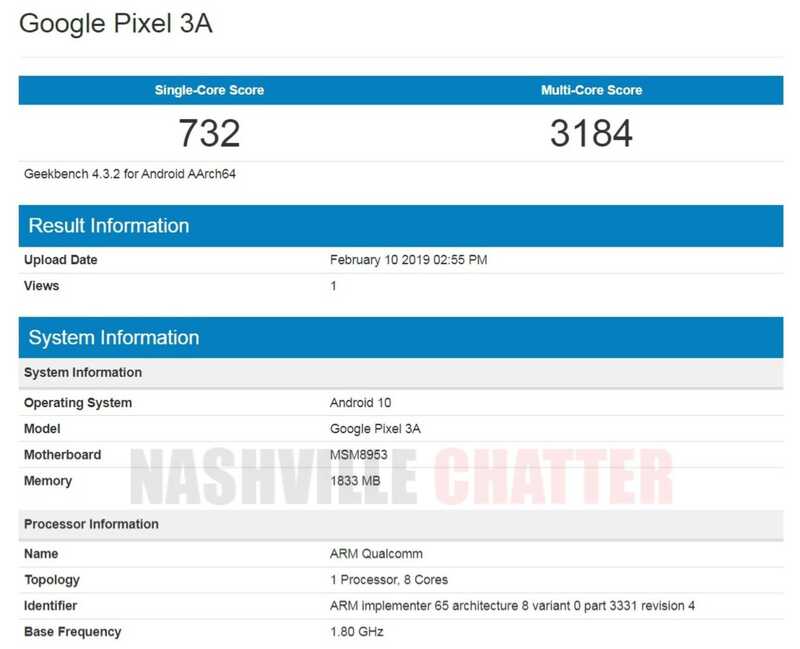 Upcoming Google Pixel 3A has been benchmarked in the Geekbench website and the listing reveals information about the processor and memory of the phone. Google Pixel 3A is also known as the Pixel 3 Lite. This is the smaller of the two Pixel phones slated to be released soon. The other pixel phone is the Pixel 3A XL, also known as Pixel 3 Lite XL. The Geekbench listing confirms the mid range specs of the phone which has 2 GB RAM and is powered by Snapdragon 625 SoC (MSM8953). In addition to the 2 GB variant seen on Geekbench, we may also expect a 3GB version of Pixel 3A phone. The OS version of Pixel 3A is not Android 9 Pie but Android 10. In the last week of January, we saw the Geekbench listing of Pixel 3A XL, which, despite being the bigger pixel phone with better specs, was found running Android 9 out of the box. It’s quite surprising because the Pixel 3A is going to be loaded with Android 10 OS, if we were to go by the Geekbench listing spotted today. The processor of Pixel 3A XL phone (codename: Bonito) is expected to be Snapdragon 710. But the processor clock speed of the Pixel 3A XL phone at 1.71 GHz is lesser than the Pixel 3A phone which is 1.80 GHz, again, as per today’s Geekbench listings. The single core score of Pixel 3A is 732 and multi core score is 3184 points, which is much below the single and multi core scores of Pixel 3A XL at 1640 and 4973 respectively. Both Pixel 3A and Pixel 3A XL phones are confirmed to be released in the Indian markets as well, as these phones with model numbers have been G020B and G020F have been certified recently in India.